Educational opportunities rank among the top priorities for home purchases. A recent survey by Realtor.com found out of the more than 1,000 home buyers surveyed, seventy-three percent of them indicated that good schools were important to their home search. 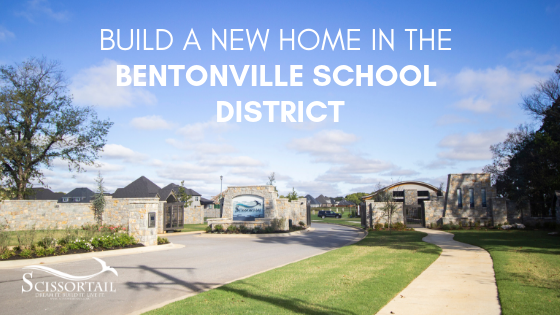 Bentonville School District is ranked among the top school districts locally and nationally. In 2017, Niche.com named Bentonville Public Schools as the best district in the state. Also, a U.S. Department of Education Blue Ribbon School, Bentonville High School is regularly recognized in the U.S. News & World Report’s national listing of America’s Best High Schools. Bentonville schools have a high standard of quality in all areas, including academics, athletics, and the arts. Bentonville students consistently perform well on the state’s benchmark exams, and the district has a strong gifted and talented program. Bentonville offers engaging programs for kids of all ages such as learning opportunities through the Early Childhood Center for preschoolers. And, for grades 2-5, qualified students are challenged to Think, Research, Explore and Create in full-day programs at the Center for Gifted and Talented Education (TREC). Older students can participate in programs such as the Honors Program, Pre-AP, and Advanced Placement courses, as well as the International Baccalaureate Program. Students who attend Bentonville Schools have access to award-winning athletics and arts programs. Several programs have earned state trophies in recent years including; football, swimming, choir, band, forensics, cross-country, tennis, wrestling, cheer, and volleyball teams. Bentonville School District ranks as one of the top three highest-performing districts in Arkansas. Their excellent academics and achievements help students soar to reach their potential making it the place to invest in a child’s future. Low teacher to student ratio (15:1) and excellent teacher salaries make Bentonville Schools the preferred district of many Northwest Arkansas families. Also, approximately 92% of students graduate, which is the highest in the state. Many, go on to receive scholarships, receive millions of dollars in scholarships, and advance to pursue degrees at higher institutions of learning. The school district encourages students to get involved with the community through programs like the Service-Learning Credit (CSL). It provides a student with the opportunity to earn high school credits through volunteering with a certified organization, gain practical experience, and add to their college applications. As one of the fastest growing school districts in the state of Arkansas, their focus is to provide high-quality education that meets all their students’ academic needs. Bentonville School District proudly supports students and families who need additional resources to achieve success in their academics. Students with learning disabilities or other learning difficulties are supported by structures through the district’s Special Services. And, the English as a Second Language (ESL) program helps students who speak, or are exposed to, multilingual families. College readiness is a high priority for the school district. Looking ahead to the future, they offer a variety and depth of courses to its students for a diverse educational experience. Students can even enroll in courses that specialize in the area they are interested in pursuing higher education. Students who attend Bentonville Schools rank among the highest in the state who complete four-year degrees at higher educational institutions. Savvy home buyers recognize the connection between good schools and strong home values, even those without children. In Scissortail, we have both. Investing in Scissortail is investing in your child’s future. Build a home where excellence lives. Are you ready to build your custom home in Scissortail? Contact us to take a tour and choose your perfect location today. Custom-Built Home vs. Spec Home: Which is Right for You?